Teagan 6-pc. Dining Set Whether it’s style, comfort or versatility you prioritize in dining room furniture, the Teagan 6-piece dining set is an excellent choice. This set’s rich walnut veneers lend a stunning, warm look that will beautify any space, while the table and bench's block-style legs provide a bold statement. Plus, a self-storing leaf gives you room for extra guests. Whether it’s style, comfort or versatility you prioritize in dining room furniture, the Teagan 6-piece dining set is an excellent choice. This set’s rich walnut veneers lend a stunning, warm look that will beautify any space, while the table and bench's block-style legs provide a bold statement. Plus, a self-storing leaf gives you room for extra guests. 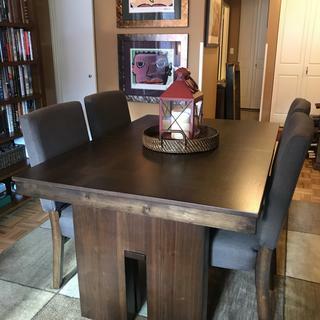 L: 60" x W: 40" x H: 30.5"
L: 24.5" x W: 20" x H: 38.5"
L: 58" x W: 16" x H: 18"
6-Piece dining set includes dining table, 4 dining chairs and a bench. Dining chairs feature polyurethane-foam-padded seats and backs, while linen-look upholstery composed of 100% polyester material provides a beautiful finishing touch and extra comfort. Great looking set, sturdy, self storing leaf and I love the bench. But table surface is easily scratched. I was able to unintentionally able to put a small swirly mark with my nail without applying much pressure. I love the table enough to look into possibly coating the table to prevent surface scratching. Beautiful set but we've had it a few months and there are scratches everywhere. I'm overall pleased with my purchase of the Teagan dining set. When we saw it in the showroom, we liked how easy it was to assemble and take apart the leaf extension (that is self storing). Unlike other tables where you have to extend the table with the legs, these are gliders and the top just slides apart where the legs stay in position. The design is simple (boxy) and doesn't have a lot of character if that's what you want, but it's an overall sturdy piece of furniture. I've only had it for a few weeks so far, but my only complaint with it right now is that I wish the chairs had better cushioning. At first the cushion feels stiff and has cushion, but just after a week of sitting on it, it's already starting to feel flat and I can immediately feel the bottom wood layer when I press down with my hand. Not a bad purchase for under $1K (delivery and tax is extra). Love the set, very nice, good quality, good sales people that were able to get us a great deal! Arrived very quickly. Excellent product...very sturdy and classy. It matches well with a contemporary or a more traditional look. I honestly am so happy with this dining set . I absolutely love it . It matches my colors in my kitchen perfect . The chair material is so nice. Bought this set a couple weeks ago and couldn't be happier. Looks very nice In our eat in kitchen and is very well made. Kids love the bench seat. Would recommend this for sure. Amazing set- very high quality, beautiful finish and comfortable (firm, but comfy) chairs. 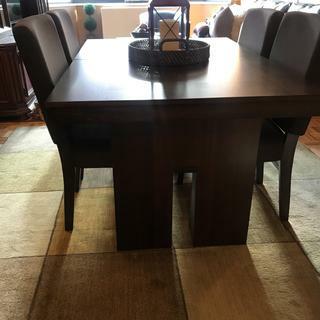 Love the table just wish they would sell extra piece to make table longer have a big family need extra space. I highly recommend this piece! Classy and elegant, yet gives you the country feel! Great quality! love this table. It is solid and substantial. The bench kids that are modern and Sleek look. I would highly recommend this item. This is a beautiful set. We ordered the set that included the bench as we have little ones running around. The set matches our dining room decor nicely. I can’t complain. Also, the service provided by Dwight was beyond exceptional. He managed to get us a great deal and scheduled the delivery timely. I can’t thank him enough for creating a seamless experience. This is a stylish dining room set and accommodates all my guests easily. The wood is dark and luxurious. The wood can be easily scratched so be sure to add the protection plan or cover with a table cloth that has padding to protect the table. It seemed sturdier in the show room although after having the technician come to tighten the base it seems a bit better supported. The extension is easy to open and close and the storage of the leaf beneath the table top is perfect. WHAT IS A SELF STORING LEAF? BEST ANSWER: A self-storing leaf folds inside/beneath the table when not in use, rather than having to be removed and stored elsewhere in the home. Can I get another leaf for the table; or does it come longer? Can I fit 4 chairs on one side? and can I get nail heads put on it? BEST ANSWER: The Teagan Dining Set does not offer an option for an additional leaf or nail heads. While four chairs can fit on one side of the table when the leaf is included, it will not allow room for the end chairs beneath the table. How many people can fit on the bench? 4 children 3-8? BEST ANSWER: The Teagan Dining Bench will comfortably fit two adults or children without having to stagger the table leg. Hi we looked at the Teagan dining set at 2 different Raymour & Flanigan stores and both salespeople couldn't figure out how to self store the leaf. How and where does the leaf self-store? BEST ANSWER: A reply has been sent directly to your personal email address. The table pulls apart and the leaf stores in the center of the table. Please contact Online Sales at 866-383-4484, option 3 for additional product details. Does this table have gliders or gears to open for leaf. Is leaf butterfly? BEST ANSWER: The Teagan Dining Table has gliders to open for a self storing leaf.